Rock Lee & His Ninja Pals! Selling Points: If the Naruto franchise hasn't registered as a blip on your screen, you have been living under a rock, my friend. So what gives? Maybe you decided to flip the station after the series got decidedly more serious, especially when the plot time-slipped its way to an older, wiser group of ninja cadets? Perhaps you were more a fan of the schoolyard rivalry between Naruto and Sasuke and not this drawn-out drama that has turned the friends into foes? All is not lost. Now, through the magic of superdeformation, famously used by the likes of Gundam, Oh! My Goddess, and Record of Lodoss War, you can chortle your way through hours of ridiculous jocularity with Naruto Spinoff! 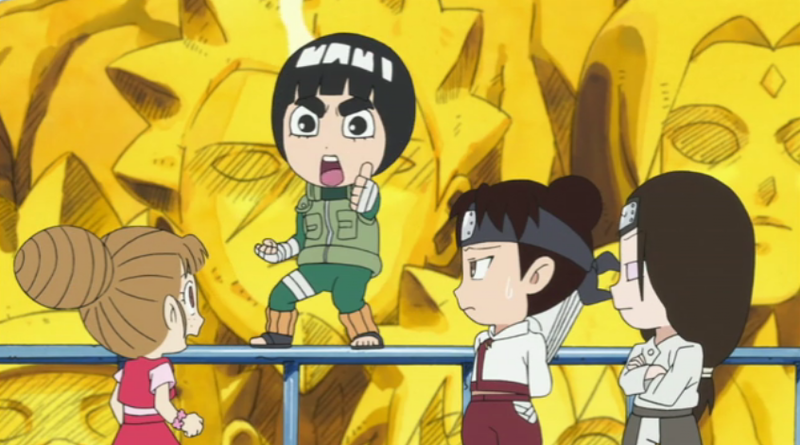 Rock Lee & His Ninja Pals (properly known in Japanese as Naruto SD: Rock Lee no Seishun Full Power Ninden)! So you all know of the legend of Rock Lee, right? The ninja who hasn't the ability to use ninjutsu? (Not to worry—you'll be reminded constantly in the show. - Ed.) Well, due to his immense popularity and his never-say-die sense of justice and self-discipline, he's über-popular with the Naruto community, but you'd never be able to tell from the others in the Konohagakure village. 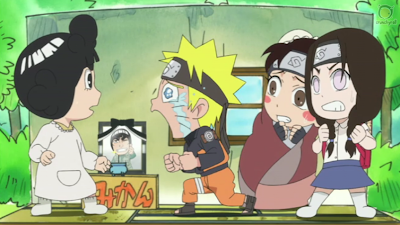 While he means well, he'll never be better than his teammate prodigy Neji, and overcompensation for his lack of skills often leads to slapstick, punctuated by a slap from his other teammate Tenten. This show is the story about their quests to become better ninjas! Actually, that's not entirely right. 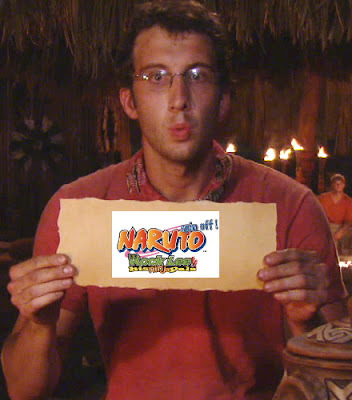 The first episode has the trio saving a kid from bumbling swindlers and competing against Naruto to get the last coupon from the village baker, while the second episode features Lee's attempts to get his crush Sakura to notice him more and his unnamed rival less. Naturally, nothing out of the ordinary happens; otherwise, that would completely kill the actual series by introducing a plot. I think you all see where I'm going with this. Final Judgment: Let's sum the show up in one word, uttered in slow motion. To preface this, let's remember that Naruto itself didn't start out as the cleanest of shows, evidence clearly presented in Naruto's "Oiroke no Jutsu", but there just seems something misguided about Rock Lee & His Ninja Friends. The show likely could find some traction if it cleverly continued to demolish the fourth wall with a flurry of shuriken, but watching it depend on the likes of pantie shots and dog poop humor makes me believe that it's trying to compete against the likes of Crayon Shin-chan for territory. If Rock Lee's such a popular character, why must they degrade him (and, by default, his teammates) with such juvenile humor? 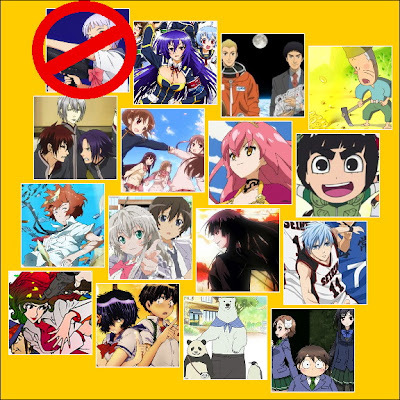 There's no denying the show is meant to be silly, but I think the show would have done much better if it wasn't dragging down its already-developed characters into these situations. Perhaps that's why true ninja comedies like Ninja Nonsense had such appeal to me; without any previous attachments to the characters, the writer can do anything to them, but applying the same formula to Naruto is a risk at the cost of the characters. I can no longer watch the original show without imagining Tenten as an angry loud-mouthed tsukkomi and Neji in a skirt and backpack. Sorry, kids. You might find it funny in its sophomoric humor, but four mentions of dog poop in the span of ten minutes are far too many to make me want to watch more. Not for adults and not for me, Rock Lee & His Ninja Pals are on the first slow boat back to the Land of Fire. Next time: Week Two's second vote-out!